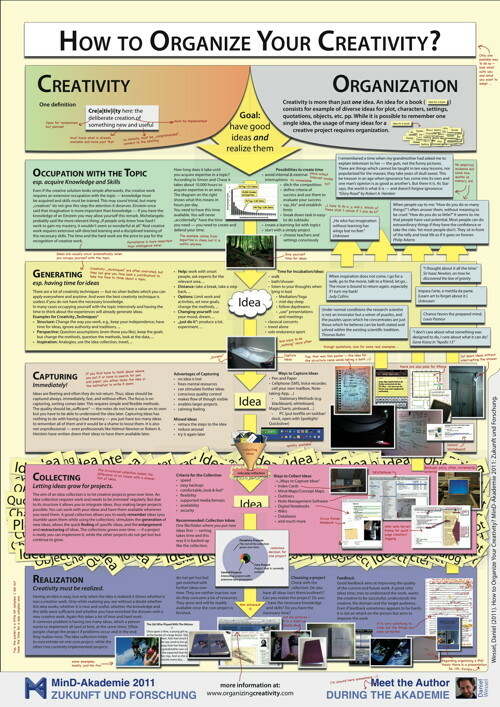 This poster shows the whole process on one page. It is the English translation of a poster I did for the MinD-Akademie 2011. If you prefer it in German find the German version here. Note that due to its size (DIN A0) it is about 7 MB. 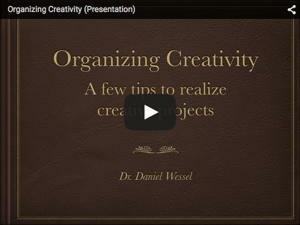 The poster shows the different steps that are necessary in organizing creativity. 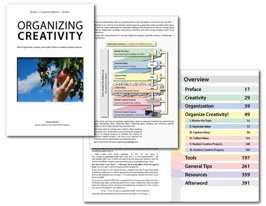 While the process goes top down (yellow arrow in the horizontal center), each step is also another occupation with the topic (yellow arrows upwards to occupation with the topic), which leads to further ideas. I have left the footer for the moment — in case you are wondering it translates as “MinD-Academy 2011 — Future and Research”. I stumbled onto your page. Excellent work. You saved me countless hours figuring things out. Now I can just get started, which is critical for me in my process. Anyway, just wanted to say good job and thanks for your hard work.